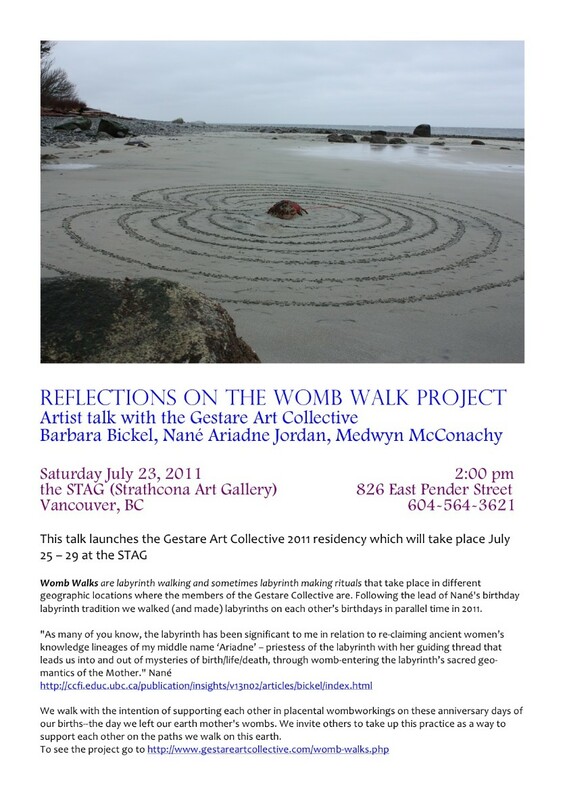 Womb Walks are labyrinth walking and sometimes labyrinth making rituals that take place in different geographic locations where the members of the Gestare Collective are. Following the lead of Nané's birthday labyrinth tradition we will be walking (and making) labyrinths on each others birthdays in parallel time in 2011. We walk with the intention of supporting each other in placental wombworkings on these anniversary days of our births--the day we left our earth mother's wombs. We invite others to take up this practice as a way to support each other on the paths we walk on this earth. Nané's Womb Walk in honour of Medwyn's birthday at Grace Cathedral in San Francisco. Visiting San Francisco, I walked up the hill to this pilgrimage site. I entered the cathedral and made my way around the various altars to Mary. I lit candles with prayer thoughts of Medwyn, and felt the presence of the M/Other surround me, which always brings me to tears with a feeling of being held. I dreamed of friends and family, feeling connected to loved ones and all. At the outdoor labyrinth, a couple lay cross-wise at its centre as I was about to walk. Their figures take the shape of a grandmother spider--I take this image as an oracle for the day and this walking experience. After they rise to leave, I walked its length to the centre, feeling grounded once again within the business of the city on this bright spring day, joy. In this joy is the gift of knowing that labyrinth walking can happen wherever you are, in crowded city accompanied by others as grandma spider, or alone on a secluded beach. Medwyn's Womb Walk in honour of the 66th anniversary of my birth at 11 am PST on a dry overcast warm Saturday morning in Courtenay, BC with the sounds of recently arrived songbirds ever calling to the sky and each other around me as I walked bathed in the scent of cottonwoods. I am told that in Asian cultures the double numbers are very auspicious, this was a double double 66th on the 11th of the twenty-first century. Auspicious seems to fit for me right now as I move through shifting awareness of myself in these crone years, constantly adjusting to the new reality of changing capacity, health and strength. 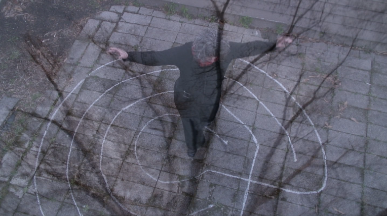 I paused at the labyrinth entrance connecting with Barbara and inviting all those allies, spirit beings and co-walkers who've journeyed through this life with me to join this wombwalk. Soon I was flooded with images of beings living and passed on who have played a significant role at some time in these last sixty-six years. Memories of faces some young, some old, some human, some animal, filled me with each step as they responded to my call. The labyrinth is newly laid near my home by myself and neighbours, simply oyster shells, rocks and driftwood placed upon the rough surface of an adjacent park land. In the centre I began to adjust the shells, creating a larger space and placing a concretion (rock form) in a turn of the path, bringing a piece of my life in the Yukon, home here to Courtenay. The labyrinth seemed to be reminding me that I have always created my own path in this life, tended it, adjusted it, claimed it and followed it through its many meandering directions. The one path beginning in the womb of my mother Phyllis Gwendolen, carrying the thread from the womb of her mother my grandmother Grace, May and now weaving this thread into my wombwalks. A bright flash of yellow greeted me as my walk ended - two male Western Tanagers flew to the tree beside the labyrinth. A gift from the winged ones, another reminder of the beauty of this living earth. The Western Tanager is a migratory bird wintering from central Mexico to Costa Rica it is the northernmost breeding tanager. The mixed woods beside our labyrinth are ideal for it to breed especially the big conifer where they prefer to hang their nests. Barbara's Womb Walk for Medwyn's birthday on May 14th 1pm CST. On this moist and green spring day in Carbondale, Illinois with the heavy scent of jasmine permeating the air I walk the grass labyrinth in my neighbourhood. 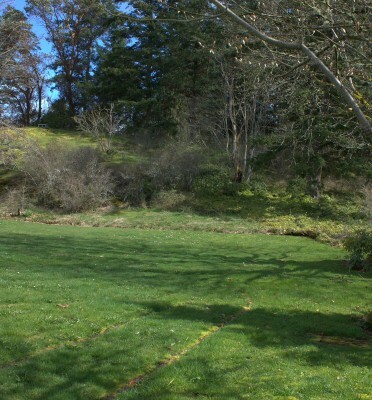 My sounding in the center of the labyrinth is accompanied by the sound of dogs barking and birds singing. Bricks mark the path of the labyrinth. Some are painted with multi-faith symbols that peak out from the ground, reminding me of the multi-faith awareness work that is an on-going earth connection between Medwyn and I. We are sorry for your suffering. Please forgive us. We thank you and we love you. The sun's warm rays competed with the chill wind as I walked the grass pathways of this Cretan style labyrinth. My walk was dedicated to Barbara and to all the gestating wombs preparing for the birthing of the next generation of our human race. I voiced my intention that they may birth into our world an abundance of peace and love for all beings. I was confused by the unusual entrance design of the labyrinth and my walk became a two and a half path experience. 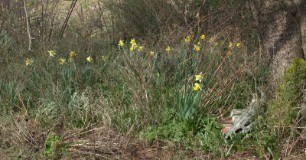 Daisies beneath my feet, birdsong in the spring air my gaze scanned the boundaries of this space. I saw a moss-covered rock mound, pine and arbutus trees, daffodils and violets in bloom, a small calm lake with a lone swan and family of ducks, and an old farmhouse sheltered by massive cedar trees. This wombspace is held in beauty. As I walked the beauty flowed into my bones, my flesh, my blood, my breath and my spirit until I was all filled up with a keenly felt experience of my wombwalking intention for peace and love for all beings. Barbara' Womb Walk on March 31st, 2011 at 6:30am. 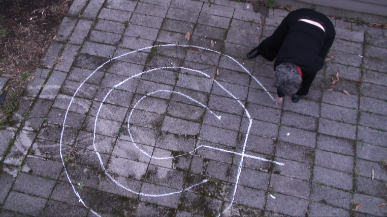 I awoke early on my birthday to make a chalk labyrinth in my back yard and to walk it accompanied by bird songs. Being a three circuit labyrinth the walk in was very quick but once inside the center I found myself literally flying back in time through the dance forms my body has known--Sufi turning, flamenco, and belly dancing--accompanied by my own vocal expressions. Until the next rain, the chalk traces of the little labyrinth will remain and be a pre-house entering ritual I can engage each time I return home. After I left the labryrinth three birds came by and explored the space, a junko, female cardinal and starling. I watched them from my kitchen window. Editing the video a few months later has reminded me that I dressed to be identified as a bird on that morning. My partner told me what I resemble most is a Piliated wooodpecker. All of the video footage is from that day and collaged together. The journey to altered states of mind is magnified through the video collage as multiple perspectives emerge and fade. The vantage point of the video is a birds eye view. From high in the old tree beside our garage,I am witnessed by a starling throughout the process as we coemerge and cofade. Video stills are below. 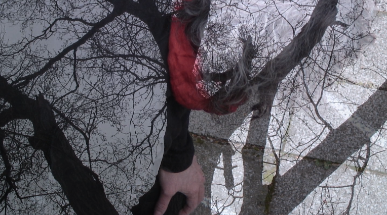 The video of my 50th Birthday Womb Walk extended the journey into the dreamtime . Womb Walk II from Barbara Bickel on Vimeo. Nané's Womb Walk for Barbara's birthday on March 31, 2011. I went to English Bay, or "First Beach" of Stanley Park as its known, to draw a Cretan labyrinth in the sand. I noticed many tanker ships out in the far waters this day, reminding me of the business of this international ocean port city. People strolled by on the pathway above the beach, or walked out on the sand with their dogs. I drew and began to walk the labyrinth. My impulse upon entering was to pick up a handful of mussel shells lying everywhere it seemed, more then I remember on this beach. I carried them to lay at the centre of the labyrinth. Despite the urban surroundings of this beach, the walk was quiet and peaceful and the sun came out to warm me up, the first sun in days. Holding and placing the mussel shells, I thought of how documenting these walks becomes another layer of meaning - there is a ripple carried in the act. I also realized that anyone living in the towers above this beach would have a great view of this sand labyrinth and might perhaps enjoy looking at its form from above. Upon leaving the labyrinth I placed some more mussel shells into the ocean and said the prayer for healing the waters of Japan. A large chorus of seagulls joined me at the water's edge, some flew high over my head. Nané's Womb Walk on February 6, 2011 in the indoor sanctuary labyrinth of St. Paul's Church in downtown Vancouver. Being indoors is a first for my birthday labyrinth walk, as I usually build a labyrinth in sand on one of our Vancouver beaches with friends and family. But I enjoy the sanctuary of this particular indoor labyrinth space at other times of the year, with its windows flooding light, the bird sounds from trees outside, and the quiet presence of contemplative others. I am accompanied by Pamela on this birthday walk and I feel held by others knowing Barbara and Medwyn are walking with us across time and space. As I walk, my limbs become heavy; I feel a sense of release, re-turned to myself - gratitude arises. 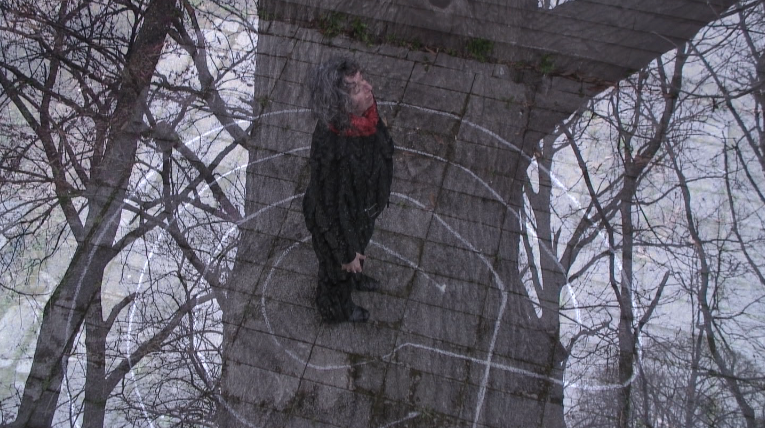 Barbara's Womb Walk for Nané on the snow covered campus of Southern Illinois University Carbondale where she teaches. Documented by R. Michael Fisher on February 6, 2011 between 4:10-5pm CST. Gum tree seed balls found on the labyrinth path and placed in the young tree in the center of the labyrinth to gestate for the coming year. The labyrinth path made by Barbara's foot prints in a measured pattern and traces of Barbara's footprints as she walked the labyrinth path. Womb Walk I from Gestare Art Collective on Vimeo. Red threads, umbilical strings connecting gestare womb walkings are wound round the rock at the centre of the labyrinth by Medwyn's circling steps.